Register Log In AmbergrisCaye.com Home Forums Nature New hammerhead shark species found in Belize? Researchers in Belize believe they've discovered a new species of hammerhead shark. 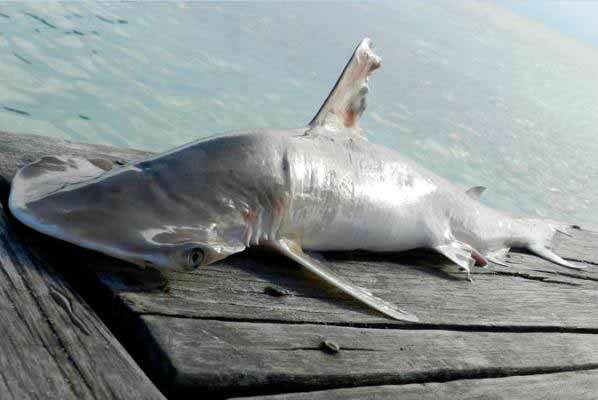 At first, scientists thought they were examining a bonnethead, a small hammerhead species found in the United States, Bahamas, Caribbean and Latin America. But DNA analysis suggests the shark is a separate species. Because the bonnethead is currently considered a single species with a wide distribution, scientists with the International Union for the Conservation of Nature classify it as a species of "Least Concern" for risk of extinction. But if the bonnethead is in fact two species with more localized distributions, that classification could change. "Now we have to define the range of each of these species individually and assess them independently against where the potential threats are," Demian Chapman, a marine scientist at Florida International University and head of a global shark survey project called Global FinPrint, said in a news release. "For example, there are published reports that bonnetheads have nearly been wiped out by unregulated fishing in Brazil. We do not know which species this is and our finding of a new species in Belize highlights that there could be more undescribed ones out there, each one facing a unique set of threats." Though the hammerhead specimen looks like other bonnetheads, DNA analysis suggests it's part of a group that stopped breeding with bonnetheads from the Bahamas, Mexico and the United States several million years ago. Since then, the group has accumulated enough genetic differences to warrant classification as a unique species. Researchers are continuing their work in Belize, and are currently working on composing a formal description and scientific name for the new species.